A Travel Collection: What Do Your Favourite Bloggers Collect From Abroad? 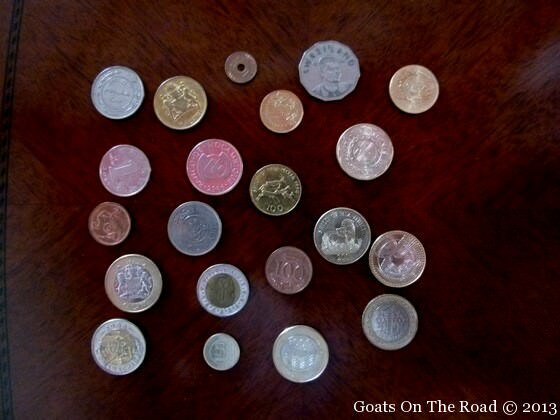 Goats on the Road Posts » Featured Articles » A Travel Collection: What Do Your Favourite Bloggers Collect From Abroad? We tend to collect one item from each country we visit. We either ship it home if we are on the road for a while or pack it in our suitcase to bring back with us. 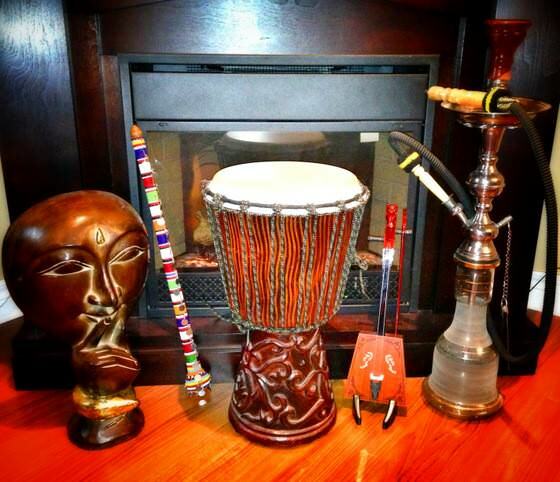 We like to buy larger items like statues or drums rather than little trinkets. That way they can can become a nice piece of art for our non-existent house. Right now we have most of our travel items on display at my parent’s house. Here are a couple of items we have out in my parent’s basement from Bali to Jordan and Kenya to Mongolia. All are locally bought and all have a little story behind them to add to our memories. Over the years I’ve become less materialistic than in the past. Travel has taught me many lessons; one of the greatest being that it’s hard on the back to carry around a heavy load. With that being said, I’ve recently realized I have a quirky attraction to unique and funky t-shirts. 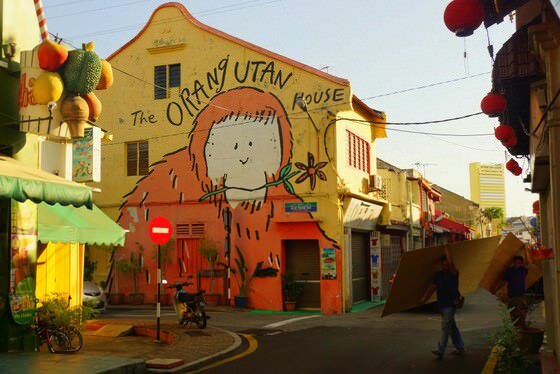 While visiting Malacca, Malaysia I noticed a brightly colored Orangutan house painted in neon colors. To say it stuck out like a sore thumb would be an understatement. As I ventured inside, I noticed the local Malaysian artist Charles Cham, was selling a plethora of different individually designed t-shirts in bright neon colors. One in particular caught my attention; it had an enormous orangutan face as the main outline with screaming loud green as the predominant color. I couldn’t just buy one. I ended up walking out of the store with 5 different t-shirts which rendered my ‘other t-shirts’ instantly obsolete. 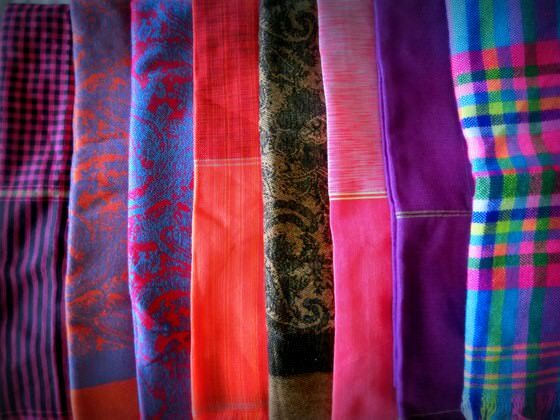 When it comes to collecting souvenirs, I have a thing for scarves. Solid shades or with patterns, bright colours or muted tones, silk or cashmere, I collect them all. I didn’t realize I had such a big thing for scarves until one of my students in Korea asked me, “Teacher, why you always wear scarf?” Part of the reason that I like collecting scarves is that I can wear them almost year round, plus they make great souvenirs for family and friends. The photo I included shows just how many scarves I have managed to collect over the past 4 months in Southeast Asia…but it’s okay, they’re not all for me! As a budget traveler, I try not to spend too much money on souvenirs. However, I love to treat myself with colorful bracelets which contain charms from my adventures. Currently, I have a collection of more than 100 different bracelets I purchased in various countries I travelled to, from Paris, Rome to Beijing and Siem Reap. Every single bracelet brings back amazing memories which I will cherish forever. My favourite one is a lovely wooden bracelet I bought in Lhasa, the capital city of Tibet. It has been handmade and painted with five typical for Tibetan religion colors – blue symbolizes sky, green air, red fire, white water and yellow earth. I often give some bracelets to my best friends as a gift if they really like it. We try and collect something that represents the country although most of the time this has come in the form of a small, cute toy! 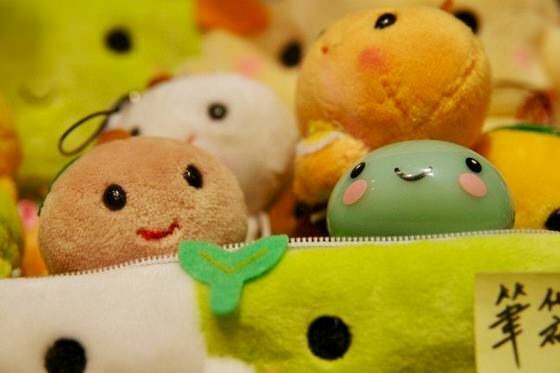 Tokyo is easily the best place for this kind of collection and our favourite ‘kawaii’ has definitely come from there. Gray also collects leaflets and examples of a country’s graphic design style – great inspiration for his design. We first started collecting masks when we lived in Malaysia back in 2004. 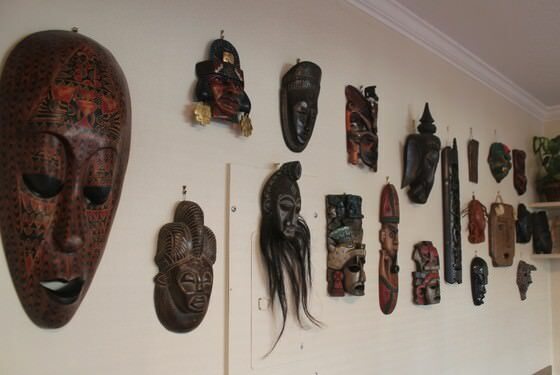 Since then, our collection has grown to over 40 masks. Most of the masks were purchased at street markets, with our favourite masks coming from Costa Rica, Peru and Italy. Up until recently our travels were always vacations (as many as we could squeeze into our years annual leave allowance). We could shop us much as we liked & if we really wanted it, we’d just pay the extra weight at the airport to fly it home. But now that we are “backpackers” or at least we are travelling with a backpack (I’m not so sure that we are fully qualified as “proper backpackers” just yet!). This has forced me to be more disciplined – I know that if I buy something – I have to carry it around with me! So I started to collect bracelets – I get one (inexpensive!) bracelet per destination. It abates my ‘need to shop’ and yet they are small enough to pack away easily. Though, in reality, I just wear them so it takes up no extra room at all! I’ve also recently started to collect flowers – I ‘press’ them in the back of my journal where they will dry out during our trip. Some of these will be added to my scrap-book, some will be attached to my “Wanderlust Board” – a GIANT pinboard in our dining room back home. I’ve become a minimalist over the past few years. Almost everything I own can be stuffed into 2 backpacks. So collecting travel souvenirs is not a priority of mine. But other than photographs, I do collect something from each country. Paper money. I’ve been to 13 countries so far (I travel very slowly) and have saved some currency from each. Except Panama, because they actually use US currency. My favorite bill is one that’s no longer in circulation. A $100 Cordoba note from Nicaragua that’s been stamped with a new denomination of $100,000 Cordobas. 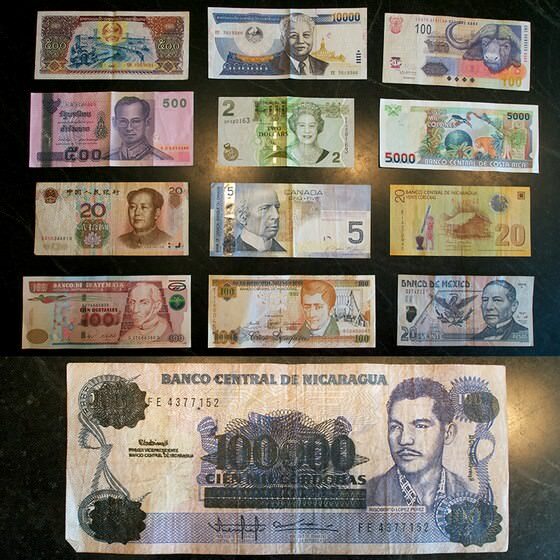 After the Nicaraguan revolution, inflation jumped up to 400% and the government just stamped its old currency with new values. If there is one thing that makes us weak at the knees, grabbing our wallets before we’ve had time to think over the practicalities, it is artwork. Wherever we travel, we always try to find one piece of authentic artwork. We have oil paintings from Paris, Batik from Indonesia, calligraphy from Taiwan-and those are just a few of our favorites! These pieces of art might not be functional right now, but one day we hope to have a worldly display, a reminder of our favorite places and an exhibition of our travels. We also love encouraging and promoting local artists! During our first 2 long trips, we bought a souvenir that would represent each culture we had been to – a sheesha pipe from the Middle East, a beautiful painting from Africa and wooden statues and bowls from SE Asia. I used to also collect a shot glass (and fill it with sand from the beach) from each country and Nick would buy a T-shirt. We’ve since realized that because we don’t have a home, there’s no point in storing all of our souvenirs in a box back in Canada! So, now I collect a bracelet from each country (just a cheap one that I wear all the time), a badge with the country flag on it and one piece of paper money – badges and paper don’t weigh anything! Nick collects a coin from each country we go to, which weighs a little bit, but not too much. These are our favourite mementos! There you have it. Since most of us carry our lives on our backs, we’re all about things that weigh very little! Souvenirs and trinkets make for some great memories and are nice to collect while abroad, but the best mementos are the photos we take and the memories we keep in our minds and in our hearts. 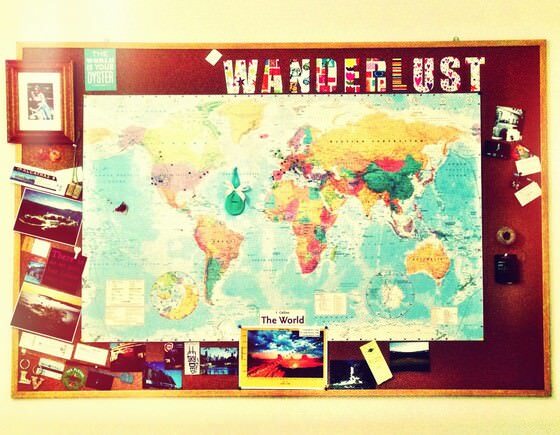 Do you collect anything from your travels? If so, what? If not, why?! Leave a comment below. I honestly thought that travelers, especially those traveling long term didnt collect anything. I think sticking to 1 item is kind of difficult as it might not be easy to find. First, I collect notebooks. I have kept a journal (or at least tried to) since 2007 so I use them a lot. However, I couldnt find a notebook to save my life in Taiwan, Macao, or HK. I know i didnt try very hard, but I dont like the idea or wasting my time looking for something to buy so if I dont find it I move on. Another thing I buy (people might think this is dumb) is a huge flag of every country, 90×120 cm (thats 3×5 feet). I have it covering my walls in my apartment in Seoul, Korea (where I live). I have a flag of everywhere Ive been except Macau (but I guess it isnt technically its own country). I got the idea from an international bar I went to in Korea where the roof was decorated with flags. I feel like a country can be represented accurately with nothing else than its national flag. I have been wavering whether to quit this collection, but did buy a flag and notebook in Peru last week. Wow! Collecting massive flags to put up on the walls of your place is pretty cool! How many do you have? I used to try to write in a journal during our trips, but it became too much writing with having the website now….I kinda miss it though! You’re welcome! We’re happy to have you 🙂 I agree, I felt a little bit better about my collecting habits as well after reading about what everyone else collects! hahah crazy socks?! That’s the first I’ve heard of anyone collecting something like that. I love it. Totally unique. I also love getting earrings from abroad as well….chandeliers and giraffes are awesome! Really interesting idea for a post thanks for including us, I loved reading about what everybody else collects! Thanks so much for participating Becky. It was great to get everyone together! Brilliant Idea for a post, so instantly relatable. No surprises that so many travellers have a minimalist philosophy. Collecting experiences is at the forefront but “souvenirs” act as great triggers for stories and feelings. I collect quotes from great connections and converations I’ve had with people. With the language barrier, unfortunately its not always with locals but it definitely places you to a mood and a place. There’s a often a reason why the quote resonates with you at that moment. I used to collect those mini liquor bottles from all over the world. I had about 150 of them, including some obscure Greek Ouzo and vodka from all over Eastern Europe that didn’t exist anywhere else, so they made great little souvenirs. But then I had to move several times and they just got annoying and I threw them all out. Still makes me kinda sad, but eh. What an awesome idea for a post! My girlfriend and I are gearing up for our year-long RTW trip, and I’ve been wondering what I can collect in each country that is personal and unique to me! Awesome post, guys! What a fun and interesting idea for a post and as you mentioned, a great way to get everyone together. I really enjoyed reading about the different items that everyone is collecting. We always brought something home with us from each place we traveled and that was usually a unique coffee mug. They are useful and of course every time they’re used it brings back memories of the places we had traveled to. Well, needless to say the collection has become so large that we no longer collect coffee mugs.  We have now turned our attention to collecting photos of everywhere we travel. 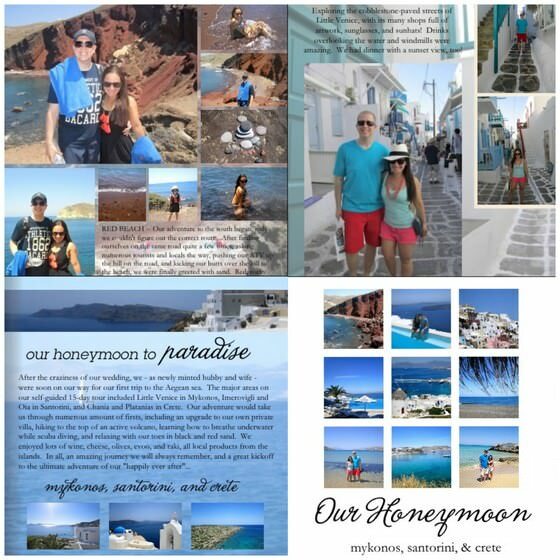 I like the idea of making photo books like Jessica mentioned. I will be looking into that as a way of saving our photo memories. Thanks for the great post. I look forward to reading more post on your blog! But seriously, that sounds pretty cool. We’ll have to collect them on our next trip. I am not a backpacker. I carry a suitcase with me and at the end of the trip, I come back home. So I am quite different from you guys. But I always admire backpackers as I think it is an awesome way for travelling. On the other hand, my mom collects mugs cups. Specifically Starbucks City Mugs. Starbucks (Yes, a coffee shop brand) has mug cups depicting landmarks or something famous with the city’s name written on it. She has been collecting them a couple years, and I also get those mugs for her when I have a chance to visit another place. We have more than 100 of them, and they look gorgeous all together in a cabinet in the kitchen. Me??? Despite I love travelling, I always tend to save money, and I am not a big fan of buying things. So I don’t have anything particular, but one thing I collect is coins. I normally keep one or a few . (they normally end up staying in my pocket even I try to spend them all!) or if I come across with shiny coins, I keep them separately and bring them home. I put them in coin holders and keep them in an album.